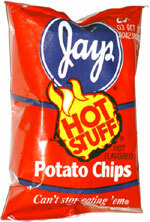 Taste test: These chips are kind of hot, but you really need to eat about three chips before you experience much heat. Even then, yeah, it's somewhat hot, but I wasn't running for a glass of water as I do with some really super hot chips. The heat does linger for a while in the aftertaste. Based on the red bag and the large words "HOT STUFF" with flames rising out of them, I was expecting something hotter. The heat really doesn't bring a whole lot of flavor along with it, so you get some heat but nothing special in terms of taste. Still, the chips are crispy and taste good when you first bite in and haven't noticed the heat yet. Smell test: Smells like paprika and maybe taco powder.